You're looking for a cheap microwave under £30. Here's the top microwave ovens from Sainsbury's, Tesco, Morrisons, B&M, ASDA, Wilko and Argos. They've won awards and have great customer reviews. Breville Manual Cheap Microwave Cream - Save 24%! Swan Retro Digital Microwave, 800 W, 20L. LOADS of COLOURS to CHOOSE FROM! Dominos Pizza Voucher FinderFind discount codes for your local store that actually work. Stock CheckerGet instant alerts when hard to find products come into stock. Amazon Discount FinderDiscover hidden Amazon products with massive savings. Microwaves have become a kitchen staple for time poor cooks, but not all are created equal. You can also buy microwaves that double up as a mini oven, grilling and cooking food as well as microwaving it. Which one is best for you depends on what you plan to use it most. Power and price aren't reliable indicators of cooking ability though. If you’re on the hunt for the best microwave deals in the UK, you’ve come to the right place. We have all the information you need from tips and guides on how to buy the microwave to suit your everyday needs to microwave sales and even where to find cheap microwaves under £30. The development of the cavity magnetron in the UK made possible the production of electromagnetic waves of a small enough wavelength (microwaves). American engineer Percy Spencer is generally credited with inventing the modern microwave oven after World War II from radar technology developed during the war. Named the "Radarange", it was first sold in 1946. The countertop microwave oven was first introduced in 1967 by the Amana Corporation, and their use has spread into commercial and residential kitchens around the world. In addition to their use in cooking food, types of microwave ovens are used for heating in many industrial processes. Microwave ovens are great kitchen appliance to reheat, grill or even bake. They are helpful in cooking a wide array of recipes and food items including popcorn, chicken grills, kebabs, pizza, muffins, even reheat the frozen food. It cooks in minutes, saving time and energy. There are a few factors though that you need to consider before purchasing a microwave for your home. These include your family’s size, food habits and the microwave features as well. However, the most important decision you need to make during the selection process is which type to purchase. There are basically three types of microwaves; solo or microwave-only, grill and combination that you can buy either as a standalone or built-in models which are more expensive. Flatbed microwaves are also becoming popular these days as they use a different technology to evenly distribute the microwaves and heat compared. You will have no problems with oblong or bulky containers hitting the sides without a turntable. There will also be fewer places for cooking grime to collect. But the cost for these are a bit pricier that the ones with a traditional turntable. Solo or Microwave-only type. This basic type is best for reheating, simple cooking, heating ready-made meals and all other simple tasks. You can also use them for defrosting food. This is also the cheapest type and widely available with plenty of models to choose from. However, it does come with limited functionality and you will not be able to brown or roast your food. Grill type. With this type not only can you perform all the general tasks a solo type can do but you it also has a grill function which allows for browning of food. You can also cook dishes that are more complex with its combination of heat from the grill and microwave energy. It is great for cooking pizzas and often comes with a metal rack. Though it does not offer conventional heating like the combination microwave and are pricier. Combination or convection type. This type can roast, heat, brown and crisp food and use convection heating and comes with grills. But it is the most expensive among the types of microwave ovens. What wattage should I go for? Manufacturers list the output power of their microwaves with a wattage figure. In theory, a higher wattage means the microwave should cook your food more quickly and efficiently. In practice, no microwave will reach its stated output wattage as inherent inefficiencies result in input power wasted as excess heat. It’s also worth noting that various standards for measuring output wattage have been used over the years, so the stated wattage of the trusty 1980s model still limping along in your gran’s kitchen can’t be easily and directly compared to new models on sale today. 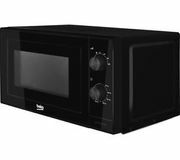 Where can I buy cheap microwaves? 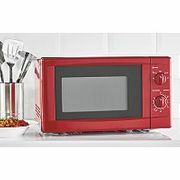 Whether it's a new microwave you're looking for or a new mini oven, Wilko got a huge variety for you to choose from, including all your favourite brands, some great value microwaves of their own as well as cheap microwaves under £30. From retro-inspired cream microwaves to ultra-modern designs, here's where you'll find our pick of all the best. You can also update your kitchen appliances with Asda and B&M's range of high quality, cheap microwaves and mini ovens from a selection of top electrical brands. 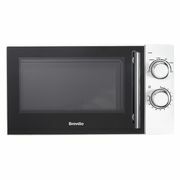 Asda currently offers the Breville 800w Microwave for just £30 from £59.99. You can also find budget microwaves that are basic costing less than £50 from Argos and Tesco. They are more likely the solo types and most will only have at least two controls for the heating power and to set time. These are usually those that do not have shiny silver finishes as well as various buttons for program choices which makes them simple to set and very user-friendly. Cheaper microwaves are also found to be quite as good as the more expensive ones for simple defrosting and reheating. However they can be a bit small so it is best to check out its specs in order to see if you will be able to fit the dishes you’ll use it for. Most microwaves with a price tag of £100 will typically be programmable which means you’ll be able to set them to defrost first and then heat. Cheaper grill and combination microwaves are available for around £40 - £100. For example, you can get this Cookworks 800W Grill Microwave D80H in Silver for just £54.99 in Argos which features touch pad control defrost setting, child safety lock Express cooking, pre-set function. When’s the best time for microwave sale? September and October. The best time to buy a microwave or most major appliances is during the months of September and October. During these two months, manufacturers unveil their latest models. This means that the previous year’s models must be discounted in order to make room for the new models that will hit stores in the winter. January. Some stores hang on to older inventory while they make the transition from last year’s models to the next. But once the New Year hits, all of last year’s remaining models must be discounted even further. Though better deals may be available at this time, selection will be limited. Any Holiday Weekend. Retailers have sales that correspond to virtually all holidays. Columbus Day, President’s Day, St. Patrick’s Day, Memorial Day, Labor Day, and most other minor holidays are good times to get great deals. Case in point, Black Friday (the day after Thanksgiving) can be a perfect time to purchase a major appliance. Remember, just because a retailer advertises an item on sale doesn’t mean it’s the best price. Make sure you comparison shop first to know whether or not the advertised deal is really the lowest around. End of the Month. As many appliances are sold on commission or subject to quotas, the end of the month can be an excellent time to negotiate serious savings. With that said, always try to negotiate regardless of what time of the month it is. After all, the worst that can happen is they won’t lower the price. Anytime Online. By just running a quick search, you can get a good idea where the best deal is online. Here at Latest Deals, our massive community of bargain hunters are always on the lookout to find the best possible deals around making it even easier for you to find amazing deals and savings online and even in-stores! The best months to buy online don’t differ from the best months to buy in brick and mortar stores, but good online prices can be found year-round. That said, remember to factor shipping into the final cost. The great thing about buying a solo is that there are so many options – but this can also make it difficult to decide. While these models don’t have a grill or convection, they still come with a range of features, so calling them basic microwave ovens may do them a disservice. Power. It goes without saying that the best solo microwave ovens usually have a high power rating. While 800W models are able to cook foods relatively quickly, 900W microwaves are even faster and usually cook food more evenly. Capacity. The interior capacity determines how much you can cook at any one time. A big microwave may have a 30 litre capacity or more, while a small one may have half that (along with a much smaller footprint). The size you need depends on the type of cooking and the size of your household. Price. While cheap digital microwaves may be tempting, they nearly always sacrifice on one of power, capacity or durability. The best priced microwaves provide value for money – not necessarily the lowest price. We recommend setting a budget before you start looking and sticking to it, although there are always great deals available at major shopping sites such as Tesco, Currys, Wilko and Argos. You can even select your price range when shopping for a microwave in Tesco. Style. Whether you care about style is a matter of personal preference, but most people want a colour that matches the rest of their kitchen. Features. Do you need an automatic defrost setting? Or auto-cook menus? Make sure you know which features are included before you buy. Other considerations. You also need to consider the brand, warranty, digital or manual microwaves and buyer reviews. Auto-reheat. Simply enter the food’s weight and the microwave will automatically calculate how long it should take to cook. Auto-defrost. Simply enter the food’s weight and the microwave will automatically choose the ideal defrosting program. Pizza function. There are many microwaves available today which comes with a cooking or reheating pizza function. Grill or combination types tend to work better with this feature as the grill will help crisp the pizza and brown its top. There are also microwaves that has crisper plates which helps crisp the pizza base. Vegetable steamer. There are also some that comes with a vegetable steamer for a fast and healthy way to cook your vegetables.